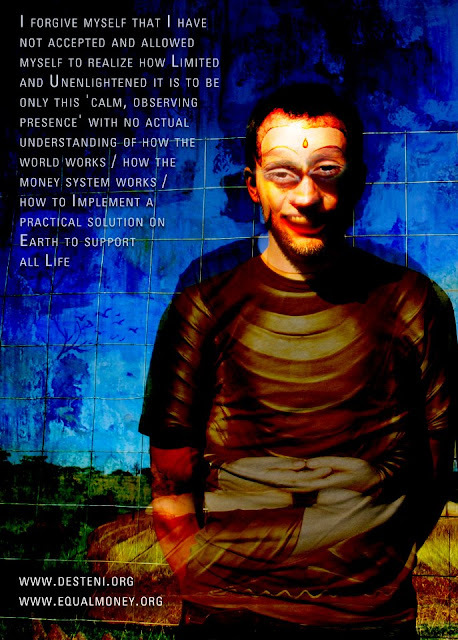 "I forgive myself that I have not accepted and allowed myself to realize how limited and stupid it is to be only this 'calm, observing presence' with no actual understanding of how the world works / how the money system works / how we can create a practical solution on Earth to support all Life"
In this post, we’re continuing with the Commitment Statements – where we have now walked Part 1, Part 2, Part 3 and Part 4 of Valuing Love more than Life, and in the Commitment Statements expanding further on the Evil in Valuing Love more than Life as well as the Solution; where we’re in the process of identifying, disentangling the Wolves Sheep Clothing – strand by strand, in showing/revealing the illusion, the evil within and behind love/good/light/positivity within the context of how it is currently being lived by/through the Mind as ENERGY, hiding/veiling the real, true nature of our beingness – instead of Love being/becoming an actual living commitment, visible, in and as this Physical Existence for self and for all in/as equality and oneness here. I commit myself to show, how it is that we can even conceive an “eternal love” to exist – when we cannot even as human beings have an actual equal and one relationship with those ‘closest to us’, that we cannot even have an equal and one relationship to our own physical bodies – let alone, humanity, ALL of this physical existence, in considering the Lives of all that is HERE as we would consider ourselves and our living, every breath and every heartbeat. I commit myself to show, that it is fascinating that we hadn’t considered this ‘split personality’ that is essentially created with personifying the PHYSICAL HEART into something that will ‘know what to do’, with accepting and allowing energies of joy and sorrow into and as it, as energies that substantiate Consciousness, the Mind – that resource energy from the Physical Body to exist. If anything, what the actual Physical Heart ‘know what to do’ is maintain its position of beating with and as the rest of the Physical Body to ensure it stands its part and its position in relationship to the entire Physical Body to ensure it continue existing/living/functioning. And, this is physically, practically, something that each one of us is not yet capable of doing: standing our position, our point, and our responsibility in who we are with and as the rest of existence/humanity to ensure we function as one body, as one life. And so, in any way personifying the HEART to be MORE than what it is in the context of actual, real, physical reality: is Delusional, creating split-personalities in the Mind, awaiting for a Physical Heart personified with an energy-presence to ‘tell you what to do’. Do we not have our own commonsense? Do we not have our own awareness? Why are we not using this commonsense, our awareness, WHO WE ARE to make informed, practical, reality decisions in who we are and how we live and how this determine the nature of our relationships in this World. Why have we gone to the extent/extreme of having to create a split-personality in relationship to the Heart ‘awaiting answers’ / ‘in/as this split-personality creation in relationship to our heart get/have access to eternal love’? Why is this ‘eternal love’ not VISIBLE in our Physical Living, in this Physical World? I mean, it’s really no different to creating a God in the Mind, this invisible higher being, as with this ‘eternal love’ as this invisible ‘higher energy’ that is only visible in the MINDS of those who actually create it in IMAGINATION with ENERGY in the quantum reality of the Mind. In this, I commit myself to show, how it’s interesting here, that – it’s like we split our SELF-awareness from the physical body equal and one living, into various Personalities in the Mind – the ‘good and evil’, into various ‘awareness’s’ in the Mind, but there is not ONE awareness that is living HERE in the Physical Body in this actual real physical reality that is in fact AWARE of our physical-relationship to the Physical Equality and Oneness in this Physical Existence that lives within this principle of equality and oneness…Why is that? That we are in fact in this PHYSICAL Existence, but no-one is really LIVING in it, with it, as it – we’ve all got all these Personalities in the Mind that CONNECT us to reality, but all these Personalities always only serve our own awareness’s /experiences / interests, it’s never in the context of the interest of ALL that is Here in and as this Existence. And, this is obviously, evidently, SHOWING in this existence, in humanity, that we’re not living in this interest of the Physical equality and oneness, but only in the MIND/Consciousness Self-Interest. And so, if we but change our starting-point from the interest of Mind/Consciousness as ENERGY into the interest of what’s best for all in equality and oneness with the Physical, we would from within who we are, change what/how we live and so change the manifestation/functioning of this World as a Whole. I commit myself to show, how/why we have never questioned this whole process of ‘opening your heart’ / ‘awakening your soul’ and then having access into this ‘eternal love’ – why isn’t everything HERE as ourselves in actual, real, visible, physical living? Why hasn’t it ever been Here, visible, physical in and as this Physical Existence? This – can be seen within the principle of the ‘Religion of Self’ / ‘Self-Interest’ – everyone is physically living in this world, this World System, with their own PERSONALITY/Mind relationships/connections to reality, but what determine this Physical World, is how we Live and Contribute to ‘life on earth’ – so, while everyone is in their Quantum Mind Energy Reality creating these split-personality relationship to the heart, the soul and then ‘eternal love’ – their very physical participation, acceptance, allowance and contribution to this World System is what is keeping the hierarchy, the separation, of humanity intact. But, this is not Seen AT ALL – cause everyone’s believed their Mind Reality is more real than the PHYSICAL REALITY – Yet, it is their REAL, Physical, Ignorant living/participation/contribution to ‘life on earth’ in the acceptance and allowance of this World System, for example, that is keeping this World the Way it is, while this ‘eternal love’ is doing absolute Nothing to any contribution/change to this World/Humanity, but for the individuals that delude themselves into and as it in their OWN MINDS. I commit myself to show, if/as this ‘eternal love’ was so great, the same with if/as this ‘God’ was so great – why, throughout generations of human civilization: has NOTHING changed, but actually in fact gotten worse…and worsening, consequentially, by the day, to the extent of driving much of earth, nature and the animal kingdom into and as extinction? I mean, has it not been considered that – with one’s direct participation, acceptance and allowance of this current World System and how we as humanity are functioning, without standing up for a change in considering all lives equally as one as self, and so in one’s direct relationship to the World System, the nature of Humanity – the countless abuse, suffering, deaths that exist at the hands of this World System: that there won’t be a consequence? That self had an opportunity throughout one’s life to make a change in THIS REAL WORLD, but was too deluded into the Mind, into Energy, into Consciousness to even consider such a Responsibility and then human beings believe they’re going to go to some ‘Heaven’, to some ‘God’ with creating an energy-experience of ‘eternal love’ in the MIND, creating an religious experience in the Mind through pitiful actions of prayer/church/reading the Bible – but NONE of it come through into actual, real physical living in and as the Principle of/as the lives of All in and as this Physical Existence.